The coat of arms of the Republic of Cyprus depicts a dove carrying an olive branch (a well-known symbol of peace) over “1960”, the year of Cypriot independence from British rule. The background is a copper-yellow colour; this symbolises the large deposits of copper ore on Cyprus (chiefly in the form of chalcopyrite, which is yellow in colour). The arms is not violating the rule of tincture, since the dove is not argent (silver) but blazoned as of the colour proper, i.e. it has the colour it would have in nature, in this case white. When Cyprus was a British Crown Colony, local colonial officials used a coat of arms (which were never in fact officially granted) of two lions passant guardant, based on the coat of arms of the United Kingdom. The Cypriot coat of arms was recently selected as the main motif of a very high value collectors' coin, the Cyprus introduction to the Eurozone commemorative coin, minted in 2008. The obverse depicts the coat of arms of Cyprus while the reverse depicts Cyprus connected with a ring to Europe, οn a transfigured map. 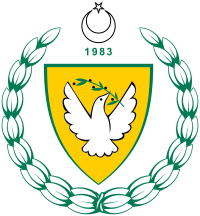 The coat of arms of the internationally unrecognized Turkish Republic of Northern Cyprus are styled closely on the arms of the Republic of Cyprus, except that the ‘1960’ was removed from the shield underneath the dove and the addition, a depiction of the Turkish star and crescent emblem is placed over the shield with the year ‘1983’ added. The year is in reference to the Declaration of Independence of the Turkish Republic of Northern Cyprus by Turkey after the Turkish invasion of Cyprus. In late 2007, a slight change to the layout of the arms was made. The dove is in a different position/attitude. The arms of the United Kingdom is used for Akrotiri and Dhekelia, since they are under British sovereignty. The Sovereign Base Areas of Akrotiri and Dhekelia do not have their own unique coat of arms. 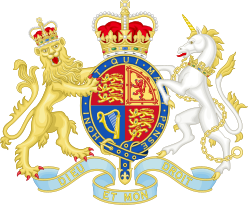 The coat of arms of the United Kingdom is used instead. This page was last edited on 5 April 2019, at 14:36 (UTC).